Voltage is the force that causes current to flow in a circuit. In fact, we sometimes call voltage "electromotive force" or "EMF." We measure it in Volts. Resistance controls the flow of current. We measure it in Ohms. These three quantities are so basic to electrical and electronic circuits, a simple equation called Ohms Law relates them. Ohms law states that the current flowing in a circuit is proportional to the voltage applied to the circuit, and inversely proportional to the resistance of the circuit. In other words, for a given voltage, the current in the circuit will decrease as the resistance increases. Ohms Law is truly fundamental. Every electrical or electronic circuit design begins here! All materials are either conductors or insulators; a material will either conduct electrical current, or impede its flow. Not all conductors are equally capable of supporting current flow. Copper is a better conductor than nickel. Silver is a better conductor than copper. Gold is a better conductor than Silver. Carbon is a poor conductor. Similarly, insulators are not perfect. Wood is an insulator if dry, but becomes a conductor when wet. The best insulators are glasses and ceramics. Plastics, such as epoxy, are generally good insulators. There also are materials that are neither conductors nor insulators. Called "semiconductors," they are used to make transistors. We will not discuss transistors here, but it is interesting that they are really only resistors that electronic circuits can control. This again shows that Ohms Law is fundamental to circuit design. There are several ways to make resistors for electrical or electronic circuits. Carbon resistors are made by attaching leads to a bar or rod of carbon material. The material is usually made by suspending carbon particles in a plastic material. The material "mix determines resistance." Carbon resistors have some serious limitations. They cannot dissipate much power, and are difficult to make with small resistance tolerances. However, automated manufacturing makes them in large quantities, so their cost is low. Some resistors are made with metal films or oxides. These resistors are small and can be manufactured with good tolerances. But, they cannot handle higher power levels. Another type of film resistor is made with conductive inks. They are inexpensive, but are unstable and have limited power dissipation and poor resistance tolerances. Wirewound resistors are made by winding a length of wire on an insulating core. They can dissipate large power levels compared to other types, and can be made with extremely tight resistance tolerances and controlled temperature characteristics. Its length, cross-section area, and material determine the resistance of a wire. Copper is a good conductor, but has some resistance (to current flow.) A small diameter copper wire, 100 feet long, may have a resistance of a few ohms. However, a small diameter nickel alloy wire only one foot long may have a resistance of several thousand ohms. 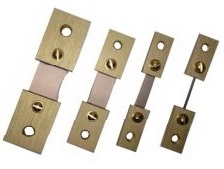 Riedon makes wire wound resistors using wire of several metal alloys and sizes. The selection of wire depends on several factors. For example, a high resistance design would require a long copper wire and the resistor would be large. The same resistor could be made with a short length of nickel alloy wire, resulting in a much smaller device. However, when a high precision resistor is required, it is easier to trim resistance by removing a few inches of a low resistance wire, than by trimming millimeters of high resistance wire. We measure electrical power in Watts. In a resistive circuit, power is calculated by squaring the current and multiplying that value by the resistance. (P=IxR) Wirewound resistors excel in higher power rating applications. Because resistors impede the flow of current, they generate heat. If the resistor operates within its power rating, the heat is harmlessly dissipated into the surrounding environment. But, if we exceed the wattage rating, the resistor cannot dissipate the excess heat, and its temperature rises. The resistor will fail, usually by acting as a fuse and breaking the circuit. If the resistor is used in a high temperature environment, its power rating must be lowered, or "derated." In wirewound resistors, another selection factor is the temperature characteristic of the wire. The resistance of all materials changes as their temperature changes. If the temperature is lowered, resistance (typically) declines. In fact, if cooled sufficiently, the material becomes a "superconductor" with no significant resistance. Increasing the temperature (typically) increases resistance. Special wire alloys are formulated to have special temperature coefficients. For example, "Evenohm" (a trade name for a low TCR wire alloy) is formulated to have a small TCR of 5 to 10 ppm/°C. Pure nickel has a much larger TCR of 6700 ppm/°C. Copper has a TCR of 3900 ppm/°C. These, and other alloys allow us to "tailor" the resistor to desired characteristics in applications where temperatures change. As a practical example, a resistor with a resistance of 1000 ohms, made from pure nickel wire, would have a new resistance of 1670 ohms if we increase its temperature from 20°C to 120°C. In the same application, a resistor made with Evenohm wire would increase to only 1001 ohms. There is another quantity that is similar to resistance. It is called "reactance." Like resistance, we measure reactance in ohms, and it follows the rule of Ohms Law. Reactance only occurs in electrical or electronic circuits if the current flow is changing rapidly. It is usually important in "alternating current" (AC) circuits where the current periodically changes direction and amplitude at some rate called "frequency." However, reactance does not exist in "direct current" (DC) circuits where current flows in one direction and its amplitude is not changing rapidly. Reactance occurs because all circuit elements have "inductance" and "capacitance." In AC circuits, the capacitance of wire wound resistors is seldom large enough to be considered, so we will ignore it in this discussion. However, the inductance of wire wound resistors can be critical! All conductors have some inductance. When the conductor is coiled, as it usually is in wire wound resistors, this inductance becomes larger. In AC circuits, inductance causes "inductive reactance." Inductive reactance and resistance add, increasing the resistor's value. Inductive reactance increases as the frequency of the alternating current increases. For example, a resistor might have enough inductance to create one ohm of reactance at a frequency of 60 Hz (cycles per second.) If we increase the frequency to 6,000 Hz (an audio frequency), the reactance would increase to 100 ohms. Increasing the frequency to 6,000,000 Hz (a radio frequency), increases the resistor's reactance is 10,000 ohms. Obviously, the inductance of wirewound resistors can be significant in AC circuits! When reactance is important in AC circuit applications, Riedon can wind the wire in a special way to eliminate or reduce the resistor's inductance.